... and the next thing you know you're like the disposable character in an Alien movie, just waiting for the creature inside to break out! On a rose bush in my backyard I found several aphids in the same condition as seen in the top photo. It has been parasitized by another insect (possibly a Braconid wasp, they were frequent visitors to these roses). After taking the first photo I did a little aphid necropsy to see the organism within. I'm not that good at micro-surgery, and at this stage the aphid has become rather brittle, but I was able to cut open the side and reveal the "body-snatcher". This is seen in the lower photo. This is an astounding pair of photos Charles! You can operate on me anytime, Doctor! An awesome display of both photographic excellence and interesting biology. Thanks, Charlie! The technical excellence of these images goes without saying, however for me they are even more striking as a powerful illustration of the nature of insect parasitization. Well, I'm running out of superlatives! I've never seen anything like this before in terms of macro photography (maybe except of Danny's white whale). Respect Charles, this is one stunning photograph. EDIT: Q: Charles, is this ("Photomicrography setup II" on your website) your current setup? Canon 35/2.8 micro lens? What the heck is that? This is more than 1:1 magnification, right? These are microscope like lenses for high magnifications, usually used on bellows. Oddly enough, I believe that Mike B just today posted a link to someone selling one of these lenses. See http://www.photomacrography.net/forum/viewtopic.php?t=2819 . I use the Olympus equivalents. 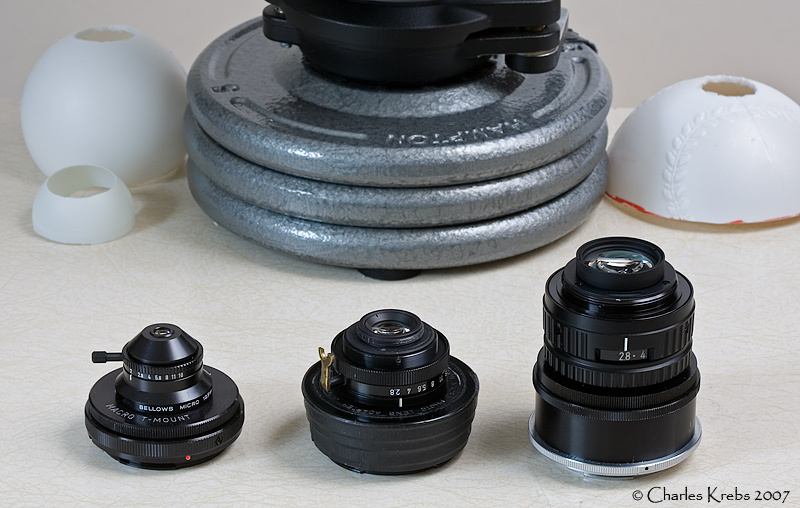 They are short-focus lenses, corrected for high magnifications and intended to be used on bellows with long extensions. The Olympus 38mm is designed for magnifications between 1.7× and 8×, using of course a bellows with extension much longer than the lens FL. Eye popping, jaw dropping photography and science Charles. Simply "INCREDIBLE"
It´s one of these shots where I have to quickly grab hold of my desk in order to prevent me from toppling backwards off my chair. As you wrote, it could be an ichneumonoid wasp larva. 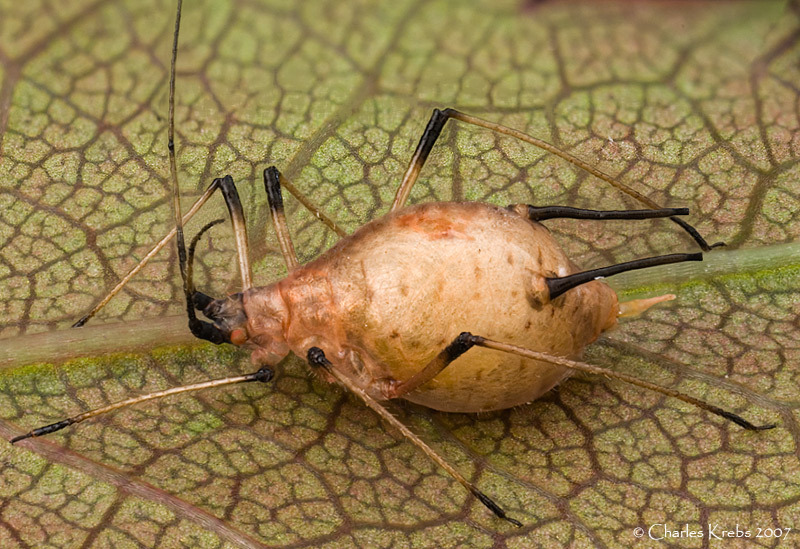 I remember having seen such bronze coloured mummies after an Aphidius sp. had oviposited into the aphids. Now, I am not saying that this is an Aphidius larva. But Aphidius spp. are commercially produced for use as biological control agents against aphids in agriculture, hence for further information Aphidius is a good keyword for search engines. The only trouble with biological control is it does not eliminate the problem, only reduce it. They sold some insects for controlling mealy bugs in greenhouses, but of course the predator prey relationship achieves a ballance eventually so enough prey remain to support the predator level. The advantage of chemicals to plant fanciers with greenhouses are they can kill them all and eradicate the problem, at least until you inevitably introduce the problem back from new introductions to your collection. L. testaceipes overwinters as a grub or pupa inside a parasitized aphid. The newly emerged wasp mates, and then begins to search for new aphids to attack. The female wasp inserts an egg into the greenbug and in about 2 days a tiny wasp grub hatches and feeds internally on the living aphid. The wasp grub completes feedings in about 6-8 days, resulting in the death of the aphid. Movement of the wasp grub inside the aphid expands the aphid, giving it a swollen appearance. 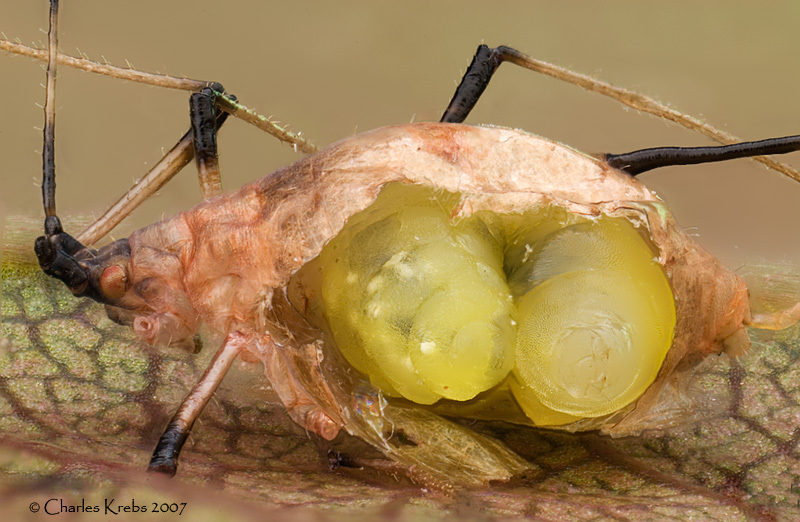 The larva cuts a hole in the bottom of the aphid, attaches the aphid to a leaf with silk and a glue, and the dead greenbug changes color from green to a brown "mummy". Then the wasp grub molts to the pupal stage, and after 4-5 days a wasp emerges by cutting a circular hole in the top of the mummy. On a couple of the "mummies" I observed, I could see that there was some substance that "attached" the aphid to the leaf. (Can't see it in the above photos however). This is mentioned in the above quote. I find this "detail" fascinating. It also explains why these dead aphids adhere so tenaciously to the leaf. Q: Charles, is this ("Photomicrography setup II" on your website) your current setup? Sven... that's my current microscope set-up. These shots were taken with different equipment. I've still got the set-up I used for these pictures on the table top, so perhaps I'll take and post a quick snapshot that might answer a few questions. Dave and Rik, thanks for great info and very useful links. Nikola... the center lens in this shot is the 35mm Canon macro used. On either side are two other lenses I often use on a bellows. To the left is a Minolta 12.5mm f2, and to the right is a 50mm f2.5 El Nikkor that I use reverse mounted. In the background you can see a few of the diffusers I use with these lenses. I took a few shots of the tabletop "macro" setup I use and will start a new subject over in the technique section... don't want to get too far off track here in the photo section. Is the EL Nikkor reverse mounted using a BR-2A ring?